Have you ever wondered, why cheap MD-Decks don't have digital out although they operate on digital audio? The answer is: They do have a digital out. This document ist about how to add a Coax or toslink connector to the MDS-JE330 form Sony.It may work also with other MDS-Models, but maybe you have to use other jumper wires to connect. Disclaimer: I tried this with my MDS-JE330 and it worked. That doesn't mean it will work with yours. You may even damage your device. Anyhow, your warranty will be void! You don't need wire 2 for the coax output! Schematic diagram for coax output. I built these circuits on a small experimental PCB. I haven't tested running both circuits parallel, but that will probably work as well. What if I have another low-end Sony Minidisc Deck? Larry Battraw informed me about S/P DIF out at his JE320. Here you have to connect wire 1 (S/P DIF) to JW17 (instead ofJW405) and the shield (GND) to JW187 (instead ofJW475). He couldn't tell about Vcc but that one should be easy to find using a DMM (see tips below). Well, that one is easy. Just look for the big, broad copper traces near the output/input section on the PCB. Take a DMM or a continuity tester to check. Or take the GND of the analogue audio connectors. You have to be sure that your 5v supply runs enough current for the toslink transmitter to drive. Search near broad coper traces and big capacitors using a DMM. That's the hardest one. 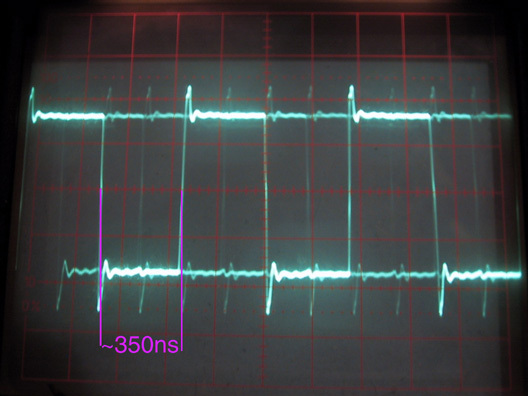 Turn on your deck (but don't start playback) and use a oscilloscope (use a high-frequency probe!) to search for a steady square wave signal with aprox. 350 ns per bit (raise to fall) or 700 ns per period (raise to raise) respectively as shown below. The picture should become unstable when playback started, showing that the data transmitted isn't 000000... anymore (which is represented in biphase mark by high-low-high-low-high-low...).